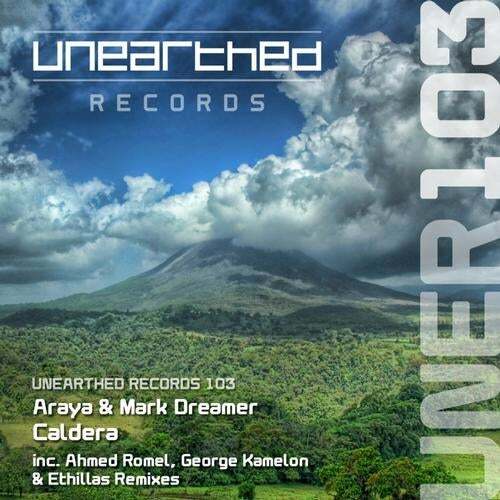 Next up on Unearthed Records are Araya & Mark Dreamer with their banging uplifting trancer Caldera. Caldera is a fierce, bubbly number with a chunky bassline, big euphoric riffs and a great drive. First up on remix duties is Ahmed Romel. Romel's remix is a massive clubby makeover with a pounding beat, dreamy breakdown, intense climax and pounding main section. Next to remix is Unearthed regular, George Kamelon. Stripping the track back a bit, Kamelon indulges in some progresive undertones whilst bringing out the raw emotion of the track. Rounding things up is Ethillas. Taking the track back to it's core components, Ethillas builds the track with a stomping bassline and crisp percussion to a smooth breakdown and indulgent mainsecion.